Glenn Beck interviews Sarah Palin with the Statue of Liberty in the Background. 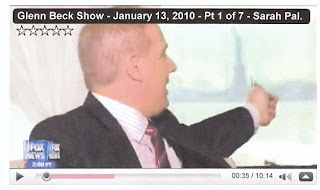 Video: Sarah Palin on Glenn Beck 01/13/10. Transcript. A word to Sarah Palin: You are being called to serve. 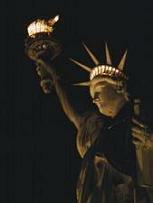 Take liberty's lamp and lead us. she is one of the only people that I can see that can possibly lead us out of where we are. I don't know yet if she's strong enough, if she's well enough advised, or if she knows she can no longer trust anyone. I don't know if she can lead and not lose her soul. That is where I'd like to go for the next hour, to find out if this is the woman that can lead us and not lose her soul. Glenn, I think the answer to your question is yes. I'm climbing the thing and bringing the torch back to her.